by Chris Woodford. Last updated: February 5, 2019. Why do people on trains and buses have to play their music so loud? Look at it from their point of view: they're trying to enjoy a nice bit of Beethoven or Schubert (as if! ), but all they can hear is the deafening throb of the engine—so they turn the volume up as far as it will go. But don't worry, because there is a solution to this problem for both of you: noise-cancelling headphones. These amazing gadgets block out the background noise, allowing people to listen to their music without unwanted distractions. Since there is no competition between music and noise, they can set their MP3 players to a much lower volume, which is better for the people around them as well. Let's take a look at how noise-cancelling headphones tell the difference between the sounds you want to hear—and the ones you don't. If you want to find out about how ordinary headphones work first, take a look at our separate articles on loudspeakers and headphones. 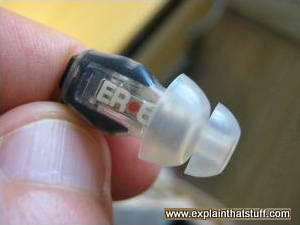 Photo: My trusty Etymotic ER-6 noise-isolating earbud headphones. These work by passive noise cancelling: each earpiece has a pair of (washable) plastic suction cups that make a tight seal in your ear canal to stop noise getting in and music leaking out. If you prefer, you can pull off the plastic cups and use disposable, soft foam ones instead. There are two ways to reduce the noise in your headphones, one simple and one complex. The simplest kind is called passive noise reduction or noise isolation. The headphones are designed so the earpieces fit snugly into your ears. No sound can escape to bother the people around you and no background noise can get in either. The Etymotic headphones shown in our top picture work this way. They have earbuds with large pieces of soft, viscoelastic foam built around them, much like foam earplugs. 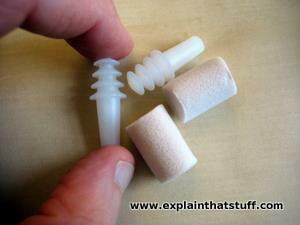 You wear them by squeezing the foam so it makes a perfect seal with your ear canal. They also come with plastic reusable earpieces a bit like the ear plugs you can use for swimming. Photo: For noise isolating earbuds to work properly, they have to make a tight seal with your ear canal to prevent ambient noise from getting in. But different people have different-sized ears, so how can one pair of earbuds fit everyone? Quite a few manufacturers now attempt to solve the problem by supplying a choice of different tips for their noise-isolating earbuds—and these are the ones that come with the Etymotic HF5. Made from different shapes and sizes of plastic and memory foam, with and without flanges, they simply clip onto the ends of the earbuds. A much more advanced way of getting rid of the noise is called active noise reduction, and it's used in the sophisticated noise-cancelling headphones that pilots use. Headphones like this have a small microphone (sometimes called a "reference" microphone) built into their case. The microphone constantly samples the background noise and feeds it to an electronic circuit inside the headphone case. The circuit inverts (reverses) the noise and plays it into the loudspeaker that covers your ear. The idea is that the noise you would normally hear is canceled out by the inverted noise—so all that's left (and all you hear) is near-silence or the music you want to listen to. Headphones that work in this way include the Bose QuietComfort®, which uses a system called Acoustic Noise Cancelling®. Some forms of active noise reduction go even further by using multiple reference microphones. Some also have a separate ("error") microphone to sample the final sound output and send feedback to the noise-reduction circuit. If the output is too noisy, the circuit can adjust how it's cancelling to try to improve its performance. Advertisements for active noise-cancelling headphones tend to exaggerate their benefits: you imagine yourself on the plane or the train, drifting off to slumber in a wonderful field of perfect silence. Unfortunately, that's not what happens. They don't remove all noise; they're best for reducing continuous, low-frequency, constant-tone sounds. For general noise reduction, simple earplugs can be much more effective—and they're obviously much cheaper too. 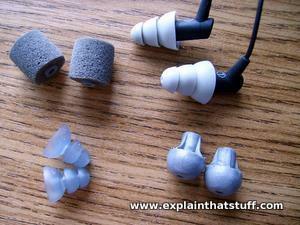 Photo: Some manufacturers combine active and passive noise reduction in the same headphones. These Audio Technica AN3 earbuds use active noise cancelling (when the power is switched on), but you'll notice they have similar suction-type tips to noise-isolating earbuds, so they reduce noise even when they're switched off. One of the big drawbacks of noise-cancelling headphones is that they need batteries to power their "active" electronics; headphones like this can still eliminate background noise even when the batteries run flat (or are switched off). Photo courtesy of Audio Technica published on Flickr under a Creative Commons (BY-ND-2.0) licence. Suppose you have the noise of a pneumatic drill (jackhammer) driving you mad. You put on your noise-cancelling headphones, switch them on, and the drilling noise virtually disappear. How does that work? We've already seen that the headphones superimpose a reversed version of the drilling noise on top of the original noise, but why doesn't that simply make the noise twice as loud? 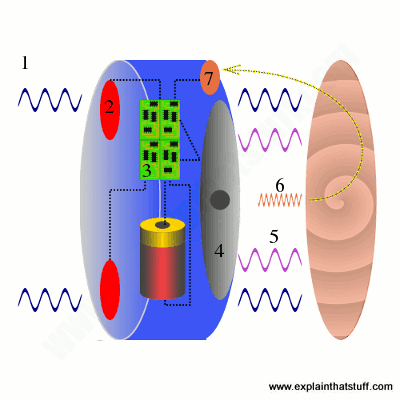 Sound is energy traveling through the air in waves. Sound waves don't look like the waves on the sea—indeed, you can't see them at all. If you could see sound traveling, you'd see it squeezing air molecules together in some places and stretching them out in others. In other words, sound travels by making the air pressure change. Now suppose there's a sound wave traveling between a pneumatic drill and your ear. At any given moment, the air between the drill and your ear has areas where the sound is compressed (compressions) and areas where's it's stretched out (rarefactions). Suppose you could exactly reverse the sound made by the drill and superimpose it on top. Now the original compressions would be replaced by rarefactions and vice versa. Two waves that are precisely reversed in this way are said to be in antiphase. Adding an original sound and the same sound in antiphase would, in theory, make the two sounds completely cancel each other out—leaving nothing but silence! Artwork: How active noise-cancelling works. 1) Ambient noise hits the outer case of the headphones. 2) One or more reference microphones pick up the noise and feed it to an active noise cancellation (ANC) circuit, which is powered by a battery. 3) The circuit inverts the ambient noise waves from the reference microphones and combines them to produce the maximum amount of noise reduction. 4) A speaker driven by the circuit plays the inverted noise on top of the ambient noise. 5) The inverted waves (purple) cancel out much of the original ambient noise (blue). 6) The greatly reduced noise that remains feeds into your ear. 7) An error microphone picks up the reduced noise so it can be measured by the ANC circuit and used to improve overall noise cancellation. Don't believe it? Test it and see! Do you believe this? It's true! We can prove it with a simple sound-recording program called Audacity. For the first half, we get silence because the two waves cancel out. For the second half, we get a noise that's twice as loud because the two waves reinforce one another. And that's how noise cancelling works! With real noise reduction, it's never possible to exactly cancel the two sounds out, so there's always some background noise left over. But it's still a distinct improvement. How do you get rid of noise you can't cancel? Photo: Earplugs like this are great for blocking out most unwanted noise, but the ultimate solution is to wear headphones on top and play white or pink noise through them. The top plugs are disposable soft foam ones and can be reused a few times before you throw them away. The bottom ones are a heavier duty flanged type that you can use and reuse endlessly. Students trying to revise while other people play music often fret about getting peace and quiet. Here's my foolproof solution to noisy neighbors, mad parties, construction noise, and other distractions that stop you working. If you're bothered by people's conversations or music, and earplugs or noise-cancelling headphones don't help you, a really effective solution is to record yourself an MP3 of white noise (steady noise like you'd hear from the wind or the sea) or pink noise (a deeper version of white noise, like an airplane engine) and put that on your music player. You can find plenty of samples on the Internet—and there are also some readymade apps that do the same thing (search your favorite app store for "white noise"). Simply play the noise in your ears at reasonable volume and it should cancel out most things. Because it's not music or speech, your brain gradually tunes it out and you can concentrate on what you're doing. 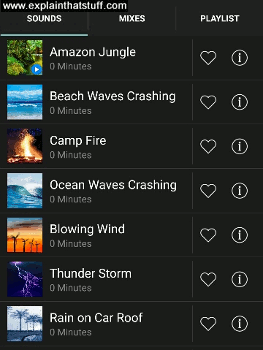 Photo: Apps like White Noise for Android let you play a variety of natural, ambient sounds through your headphones, including waves crashing on the beach and rainstorms. Use an app like this as an alternative to white noise, if you find it too harsh and disruptive. The ultimate solution I've found for really disruptive construction noise is to put foam earplugs into your ears, put large headphones on top, then play the white or pink noise as well. The combination of earplugs, headphones, and white/pink noise will cancel out virtually any background noise without damaging your hearing. A pretty extreme solution, but it really does work! Two things to remember. First, foam earplugs are viscoelastic, so you have to curl them up tightly to squash them into your ear canal, then hold them there for 30 seconds or so while they relax and seal themselves firmly in place. Second, if you block noise this way, you will also block sounds from things like telephones and (more seriously) smoke detectors and carbon monoxide alarms. Who invented active noise reduction? Many people suppose that Bose, which sells the best-known brand of noise-cancelling headphones, invented the technology—and did so relatively recently. In fact, as Professor Colin Hansen (of the Department of Mechanical Engineering, University of Adelaide) points out in an excellent introductory book on the subject, the technology is much older. Hansen traces it back to experiments with telephones in 1878, and notes that the first patents were issued (separately) to Romanian aircraft engineer Henri Coandă in 1932 and German physicist Paul Lueg the following year (see his US Patent: 2043416: Process of Silencing Sound of January 27, 1933, patented in the United States in 1936). Both men developed systems for cancelling out sound waves by adding other waves in antiphase. Many others built on this work, including synthesizer pioneer Harry F. Olson. Until the early 1990s, active noise reduction was little more than a "laboratory party trick"; then, as Hansen notes, the science swiftly became a practical technology, with a growing number of everyday commercial applications—the best known of which are noise-cancelling headphones. Artwork: If you believe Bose invented active noise cancelling quite recently, this artwork should convince you otherwise. It's Paul Lueg's conceptual representation of noise cancelling from his 1936 patent. Suppose a sound source (A) plays a sine wave (S1) in a long pipe (T), and that we sample it with a microphone (M), boost the signal with an amplifier (V), and play it back with a loudspeaker (L). Providing the distance between M and L is just right, we'll produce an inverted sound S2 that exactly cancels S1. As I showed above, we can do the same thing just by inverting S1. Artwork from US Patent: 2043416: Process of Silencing Sound courtesy of US Patent and Trademark Office. Understanding Active Noise Cancellation by Colin H. Hansen. Spon Press, 2001. Active Noise Control Primer by Scott D. Snyder. Springer, 2000/2012. Active Noise Control: Fundamentals for Acoustic Design by Giora Rosenhouse. WIT Press, 2001. Six of the Best Noise-Cancelling Headphones to Silence the Commute by Samuel Gibbs, The Guardian, 28 October 2014. Compares six leading brands from Bose and rival manufacturers. Bose Releases Noise-Cancelling Earphones for Silence-Seekers by Kif, Wired, 30 July 2013. How Bose packed its popular QuietComfort headphones into a slimline earbud model. Review: Noise-Cancelling Headphones: Shut Up, World by Michael Calore, Wired, 18 June 2012. Another clutch of headphones compared. Noise-Cancelling Devices for a Good Night's Sleep by Farhad Manjoo. The New York Times, July 6, 2011. Turn your smartphone into a pair of noise-cancelling headphones! These give much more technical detail, but are harder for non-scientists to understand. US Patent: 2043416: Process of Silencing Sound by Paul Lueg. 9 June 1936. One of the very first noise-cancelling patents. US Patent 20140086425A1: Active noise cancellation using multiple reference microphone signals by Thomas M. Jensen et al, Apple Inc. Application date: 24 September 2012. 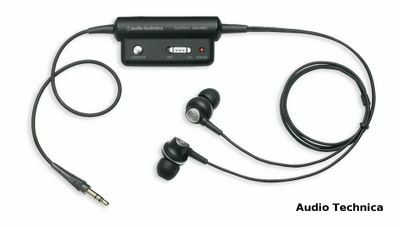 A typical modern noise-cancelling earbud featuring two reference microphones and an error microphone. Acoustic Noise Cancelling and QuietComfort are registered trademarks of Bose Corporation.